Streisand was a struggling actress and nightclub singer in the early 1960s, before landing her first part in a Broadway show, I Can Get It for You Wholesale, in 1962. Her first record was the cast album for that show, and she shot to national stardom after an appearance on The Ed Sullivan Show. She quickly signed with Columbia Records, and her first solo album, The Barbra Streisand Album, was a top-ten, gold-selling record in 1963. On Broadway, she starred in Funny Girl, which ran two years, and her first top-ten single, "People", came from that show. 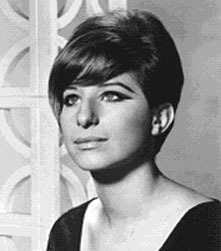 A series of network television specials (back when there were only three networks) helped sell her albums, and Streisand won an Oscar starring in the film of Funny Girl in 1968. Her movie work includes romantic comedy (The Owl & The Pussycat), screwball comedy (What's Up Doc? ), and the big tearjerkers The Way We Were and A Star is Born. She has also occasionally directed films, always starring Barbra Streisand: Yentl, The Prince of Tides, and The Mirror Has Two Faces. Streisand has had more albums go platinum than any other female singer, and with forty-seven gold albums, she's in second place on the all-time list, trailing only Elvis Presley but ahead of The Beatles and The Rolling Stones. Almost every album she's made has sold at least a million copies. In 2000, she sang a series of "farewell concerts", with tickets selling as high as $2,500. Anti-fans, meanwhile, hate Streisand's music and films with a passion beyond measure, deriding her as overly melodramatic, big-nosed, and in love with herself. Yentl, for example -- there aren't many movie musicals where one singer sings all the songs. Some of Streisand's biggest hits have been collaborations. She's recorded duets with Neil Diamond ("You Don't Bring Me Flowers") and Donna Summer ("No More Tears/Enough Is Enough"). The Bee Gee's Barry Gibb produced her biggest selling album, Guilty, which included the #1 hit "Woman in Love." Streisand is also one of show business's most outspoken advocates of leftwing politics.